Cycling around cities may have been pioneered by the Dutch, but a new high-tech way of hiring bicycles is bidding to bring a pedal power revolution to cities around the world. The key innovation is the dockless hire bike. Found and unlocked with a few taps on a smartphone, they can be hired for an hour, day, or week - then locked up and left wherever the journey ends, rather than a special docking area. These now make up the majority of the 18 million self-serve, public-use bikes around the world, in 1,608 cities. That's up from just two million at the end of 2016, says Russell Meddin, co-author of an online world map of bike sharing. Most of this growth has been in China, where two start-ups, rich with backing from the country's rival giant business groups, are battling for dominance on the streets. Ofo is backed by the e-commerce giant Alibaba, while Tencent Holdings - Asia's richest company - is championing Mobike. Alex Borwick, who lives between Shanghai and Beijing, was an early Mobike user. She calls bike sharing "much easier than having your own bike as you don't have to carry a lock and worry". And she "definitely" has used the service more for being dockless, because it "means you can take a bike to where you need to go, not to a dock". This duel saw some 1.5 million bikes pushed onto the streets of Shanghai alone. But the battle for market share left mountains of castaway bicycles in fields near Shanghai and places like Xiamen in the south-east. 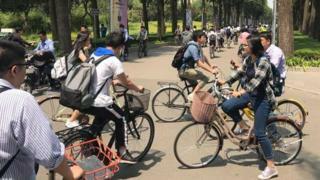 "There were and are some bicycle mountains, but now there seem to be fewer now," says Jady Liu, an undergraduate student at Beijing Normal University. In September, China's large cities prohibited companies from putting any new bikes onto the roads and since then the mountains have started to disappear. Mobike has spread to 100 cities, including Manchester in 2017 and Berlin earlier this year. "China's ones are the only truly global [bike sharing schemes]," says Mobike's Steve Pyer, a veteran of London's "Boris Bike" cycle hire scheme. Aside from the convenience of being able to leave it anywhere, dockless bikes are massively cheaper to run than these more familiar dock-based schemes. A typical London bicycle dock with capacity for 25 bikes, costs about £100,000 to install and maintain, says Mr Pyer. Moving the locking and payment technology from the dock to the bicycle means you can deploy them very quickly. GPS sensors help riders locate available bikes on a smartphone app, and booking and unlocking is done by scanning a QR code or using RFID (radio frequency identification). The onboard tech is powered by a battery charged by a dynamo as the cyclist pedals. The success of the bikes in China has attracted investors' interest. Venture capital investment in dockless bike-share firms around the world reached $2.6bn (£1.9bn) in 2017, up from $290m in 2016, according to San Francisco business intelligence company Crunchbase. Karan Girotra, a professor at Cornell University's new graduate programme, Cornell Tech, says there is a rush to be first into new markets, with firms betting that "once you get in there, you will acquire customers and drive other competitors out of business." 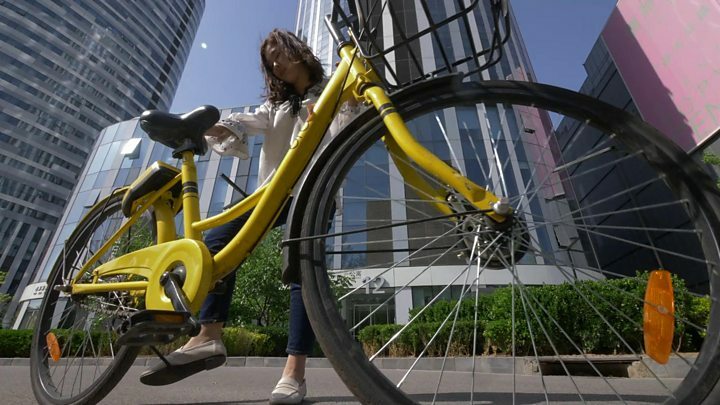 And while the largest traditional dock-based system in east China's Hangzhou has 65,000 bikes, the start-up Ofo operates 10 million, says Prof Girotra. With traditional dock-based systems - like those in London and Paris - "people loved it but costs turned out to be higher, and advertising revenue turned out to be lower", he says. Economies of scale bring down the cost per bike for the Chinese companies to "well under $100" rather than "$3,000 to $5,000" for dock-based systems, he adds. Dockless bike riders don't always leave the bikes in the ideal places for other riders to start their journeys, so the scheme operators do have to move them around. In Oslo, one start-up has been using machine learning - a sophisticated form of data analysis - to predict how to distribute bikes most efficiently. "We try to maximise the number of trips each bike takes before we need to move it again," says Axel Bentsen, chief executive of Urban Infrastructure Partner, which runs Oslo's bike sharing programme. "It's very difficult to do that manually, and machine learning is finding patterns and suggesting changes we wouldn't be able to come up with ourselves." Car-sharing companies are eager to branch into bike-sharing for passengers' short trips at the end of a journey. In April, Uber bought New York-based start-up Jump Bikes, paying nearly $200m, according to Techcrunch. Meanwhile Uber's rival in India, Ola, introduced a bike-sharing service late last year called Ola Pedal. And Singapore-based Grab, another Uber rival, backed a dockless bike-sharing service called oBike last year. Prof Girotra says data about our biking habits could also prove quite lucrative. "If you want to know where people are, they can turn off mobile phones, but with a bike you know precisely at which shop they've pulled up," explains Steven Fleming, founder of Australian and Dutch consultancy Cycle Space. It may be a while before the rest of the world catches up with Amsterdam, where 66% of all trips are made by bike. But it is the unlikely combination of venture capital and Chinese internet giants that could get us there sooner than we expect.